The opener came after Sergio Ramos escaped punishment for an elbow on Milan Havel, but there was no stopping the visitors as Casemiro extended their lead in the 23rd minute. Benzema doubled his tally and set up Gareth Bale in the space of 144 seconds towards the end of the first half, and Toni Kroos floated a beautiful 67th-minute chip home to wrap up the win and leave Plzen playing solely for third place. Madrid’s injury-hit defence almost conceded in the ninth minute when Nacho Fernandez sent Patrik Hrosovsky’s cross against the bar. Havel was left with a bloody nose after being caught by Ramos’ in a 14th-minute challenge, and the injury sustained by the Plzen midfielder eventually led to his first-half withdrawal. Madrid soon asserted their superiority when Benzema was granted space to run into and he used it to slot his milestone strike between the legs of Ales Hruska in the 20th minute. More shoddy defending from Plzen enabled Casemiro to glance Kroos’ corner home, before Benzema took his tally for Madrid to 201 by nodding Bale’s cushioned header past Hruska. The Frenchman returned the favour three minutes later, flicking Sergio Reguilon’s delivery on for Bale to volley back across goal and into the bottom-left corner. 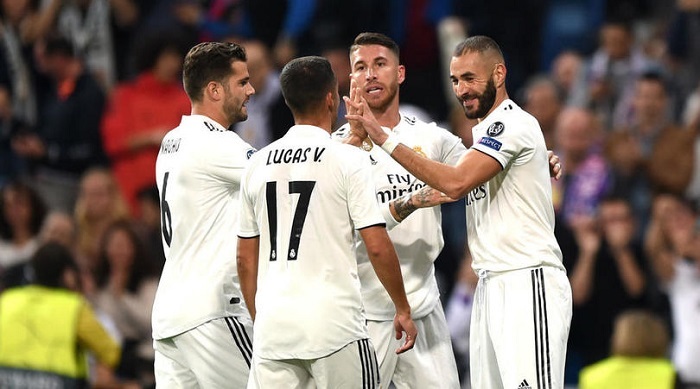 Solari handed Javi Sanchez and Vinicius Junior Champions League debuts in place of Ramos and Benzema and the Brazilian marked the occasion by setting up Kroos for a fine goal. Lucas Vazquez was denied by a contentious offside decision and Bale rattled the upright in stoppage time as Madrid cantered to three important points. With Madrid and Roma locked on nine points at the top of the group, their clash at the Stadio Olimpico in three weeks could well prove pivotal to who potentially earns a better draw in the last 16. If Solari can continue his winning start into that match, it will be tough to see past Madrid getting what they need to finish top. By surpassing 200 goals for Madrid, Benzema became just the seventh player to reach the total in the club’s history, joining names like Cristiano Ronaldo, Raul and Alfredo Di Stefano. Having struggled so much in front of goal over the past two months, he now has four in his last five outings in all competitions and will hope to maintain his resurgent form. Plzen left-back David Limbersky appeared to duck out of the way when Casemiro rose to head in Madrid’s second, and his lack of aerial prowess was exploited again by Bale and Benzema as they assisted one another to take the visitors’ tally to four before half-time. Madrid will be hoping to close in on LaLiga’s top four when they travel to Balaidos to face Celta Vigo on Sunday, while Plzen take on Pribram at home on the same day.